A group of young Russian sailors circumnavigated the world in a single navigation season, along the northeast and northwest routes, without an ice-breaker. Back in 2010, a group of young Russian sailors wrote themselves into the history books with a groundbreaking nautical achievement: They became the first in history to circumnavigate the Arctic Circle in one navigation season – and achieved this feat without an ice-breaker. 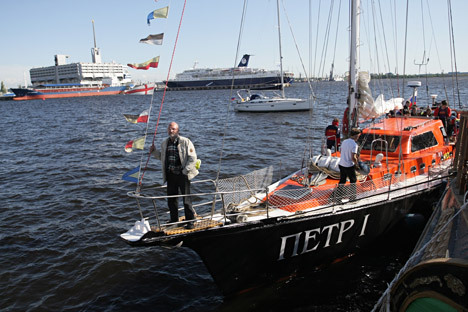 The Russian crew of the Peter the Great yacht set off from St. Petersburg on June 4, 2010, and crossed the imaginary finish line, the entry to Lancaster Sound, in Nunavut, Canada, on September 20, 2010. It took the sailors, all of whom were under 26 years of age, three months and 16 days to cover a distance of 9,023 nautical miles, including 3,000 miles in the ice, and reach their coveted goal. The whole voyage, which lasted six months, covered a distance of 13,000 nautical miles. I learnt all this from Sergei Murzayev, one of the expedition’s crew members. He first met the captain of the yacht, Daniil Gavrilov, in the summer of 2009 at a Baltic regatta. It was then that Murzayev heard of the proposed expedition for the first time. When, at the end of the season, he received an invitation to join its crew, he knew it was an offer that was impossible to refuse. Practically all the work to refit the yacht, preparing it for harsh Arctic conditions, was done by the crew themselves. "At first, the voyage was supposed to start on June 1, but we realized that it was unrealistic and moved it to June 4. In the end, we were able to set off only at six in the evening on June 4,” says Murzayev. “Up to the very last minute, our fuel injection system was not fully assembled, our steering system was not adjusted, the components were not assembled. Only the essential work to allow the yacht to move had been completed, the rest was done as we went along. The team, which had a core crew of six people, was immediately hit by bad weather on setting off on their voyage. “Our fuel tanks were not attached properly and their tops came off, diesel fuel began to leak and seawater got into the tanks. And there was seasickness on top of it all,” says Murzayev. After leaving Murmansk, the yacht entered the Arctic Ocean and headed towards Novaya Zemlya. Throughout the whole expedition, the outside temperature fluctuated between zero degrees Celsius and five above zero. “We were traveling along Russia's Northern Sea Route during the polar day,” says Murzayev. “The sun did go down, but it never got dark. In fog, it was freezing; if you saw fog ahead, it most probably meant that there was ice there. At night we would suffer from frostbite. Moving through the ice represented a tough challenge for the crew, who would spend 12 hours on watch duty on the deck, struggling as best as they could to find some clear water. “We moored onto ice floes many times. That is, we would approach an ice floe, jump onto it, cast the anchor and wait for the wind and the current to change, watching the ice as it drifted by. We spent two weeks in the ice,” explains Murzayev. A day before leaving the ice behind, the yacht hit a floe, resulting in a bent rudder blade. Despite the setback, the crew managed to lead the vessel, which was practically unsteerable, into clear water and to reach a port, where sailors from the tug boat Neotrazimy, along with the local residents, helped to repair the damage. However, in spite of the difficulties the crew endured navigating through the Arctic ice, it was the storms that proved the most memorable challenge they faced during the voyage. “We had our first storm when we were leaving St. Petersburg,” says Murzayev. “Then in the North Sea, as we were leaving Murmansk, there were long sloping waves and it would take us a very long time to climb up the wave ridge and a very long time to get down. My body let me down then; I could not get up for six hours. The crew faced a battle on the approaches to Norway in the North Atlantic on their homeward run, with hail and winds of 35 meters per second battering the yacht one night. After the first sail was blown away, the sailors almost lost the second one as they lowered it, and were forced to ride out the storm at a speed of 12-13 knots. The challenges offered by the severe weather conditions were compensated for Murzayev by the pristine majesty of the Arctic seascapes and the variety of animal and sea life the sailors were able to observe in their natural environment. "What struck me most during that voyage was the beauty of nature, untouched by humans: icebergs, glaciers of stunning beauty. The north is mesmerizing. Most people who have ever been there long to go back. "We saw a polar bear and her cubs; and seals, although they are a bit timid, whereas walruses are very curious: They would come to see us and would swim around the yacht. Ringed seals are very cute. In Canada, we saw dolphins." In November 2010, having spent six months at sea, the crew of the Peter the Great yacht finally returned to their home port. "During that voyage, I realized that everything in life was real and possible, as long as you wanted it badly enough. Things will get tough, life in general is tough. There are such things and chance and good luck, but still: If you are not afraid and steadily move towards your goal, luck will be on your side."